Fox News' Ben Ramos discusses IP/cellular newsgathering. Live streaming technology is rapidly changing the way broadcasters gather the news. No more so than at the US network, Fox News. Ben Ramos, Senior Director of Field Operations and Emerging Technologies, says IP and cellular transmissions now account for about 50% of their incoming news video. He said, "The first news content we get is often via a cellular technology. For example, if a Fox News viewer happens to be standing in front of some breaking news, they might use their iPhone or Android device to send a photo or video to our uReport team (ureport@foxnews.com). That's our first line of defence. Then our own team will show up and they'll also have cellular technology: iPhones and a LiveU backpack for transmitting video. To truly guarantee initial transmission capability, our first breaking news deployments also include BGAN, Iridium and iSatPhone satellite phones. 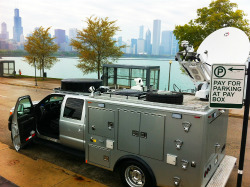 The next level, which normally takes more time to deploy, will be the arrival of our microwave or satellite truck. So it's now got to a point where we utilise all technologies to gather the news." Fox News has deployed 26 LiveU backpacks in its bureaus around the world and it has 6 KU-band satellite trucks and 4 KU/IP Hybrid Quick Response Vehicles. Ben said, "The LiveU backpack goes out first and more often because we have more of that technology at our disposal and that's because it comes at a lower cost. But we have a tool kit which has cellular, microwave and satellite capabilities and we pretty much use them all every day." The new cellular technologies have enabled Fox News not only to increase the volume of its newsgathering but to do it in a very cost-effective way. 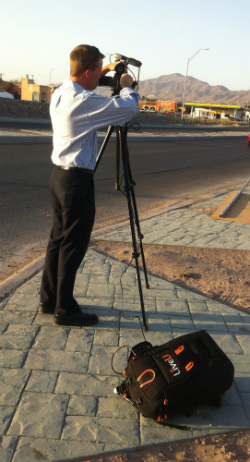 "We are transmitting more live pictures than we have ever done before at a lower cost," said Ben. "We have saved millions of dollars even in this one last year covering politics in the United States. It has been a massive game-changer on the budget front." Although newsgathering via the cellular network can have inherent problems - such as insufficient bandwidth available – Fox News believes the advantages far outweigh the negatives. "The system is fairly robust," said Ben. "It's true it doesn't always work. Over the years there've been some fairly high-profile aggregation failures. We had one ourselves on Obama's train towards Washington DC at his inauguration. However, none of the aggregators - LiveU, TVU, Dejero and Avenir - is going to work if there's no throughput or there's too many people on the network which causes congestion. But some of those companies are doing a good job with adaptive bit rate, adaptive resolution, utilising long delay and forward error correction and audio priority to help mitigate those problems." Ben added that the IP bonding technologies can make transmission more durable. "LiveU may occasionally fail over cellular networks due to lack of available bandwidth. However, LiveU's encoding aggregates any IP network - cellular, terrestrial and satellite, improving quality and reliability compared to traditional transmissions that rely on a single transmission path." In fact, Fox News recently deployed a new type of transmission vehicle they call their 'Quick Response Vehicle'. It utilises bonded cellular and traditional KU/IP satellite technologies (Comtech 570-L modems) and a new comms-on-the-move satellite technology (Raysat E 7000 antenna) to make their on-the-move transmissions better quality and less likely to break up. Ben said, "I think another solution to Quality of Service will either come from the cellular providers themselves - if they ever decide they want to sell Quality of Service on their networks - or it's going to be probably the advent of ubiquitous, inexpensive satellite capacity which I think Ka-band could be the solution to somewhere down the road. But those Ka vendors are just starting out and it's still in its infancy right now." Fox News has tested Ka-band antenna units in its New York and London bureaus. "Both of them worked very well in terms of the throughput," said Ben. "We were getting between 4 to 10 Mb/s. This shows a future vision of HD pictures from anywhere in the world in an airline-checkable case." However, one of the issues faced by Fox News was that the 90cm antenna proved insufficiently robust in very windy conditions. Ben also questioned the efficiency of some of the satellite space booking procedures. Despite the teething problems, he's optimistic Ka-band has a bright future: "Once Ka-band and vehicular on-the-move Ka-band technologies are a little more mature, it could be a Quality of Service HD game-changer, on a budget, for newsgatherers." It’s the prospect of on-the-move transmissions that particularly interests Ben. He said, "I'm a big proponent of on-the-move technologies and the backpacks definitely lend themselves to that but don't necessarily allow us Quality of Service. So I think the future for Fox News will be a lot of on-the-move vehicular antennas. You can never tell when breaking news will happen; it's a huge advantage to be transmitting before you even arrive at the story – hit the ground running." "Here in New York we've just been talking about our Jerusalem bureau; keeping our teams safe is our number one priority. For them to roll up in their old satellite truck slows them down a lot. Just turning on their LiveU backpack keeps them that much more mobile and when we can throw an on-the-move antenna on top of an armoured car and they can transmit from inside while driving, it's a big advantage. So we're looking very closely at all on-the-move technologies for those reasons." Somewhere in the future Ben believes all broadcast cameras will themselves have in-built connectivity to networks which will enable instant newsgathering. He said, "If you look ten years into the future, every time a Fox News camera is turned on we'll instantly see the transmission back in New York or perhaps in the Cloud; it definitely has to go that way. I know that multiple encoder manufacturers and aggregator companies are talking to Sony, Panasonic and JVC. In fact, JVC already has a camera that does FTP internally. So that has to happen and definitely will."